NASA’s Mars Curiosity rover celebrated its two-thousandth Martian day, or Sol, on the Red Planet on March 22nd, 2018. In celebration, NASA issued a new photo-mosaic of images captured by the rover in January 2018, which have been processed to provide a offers a preview of what comes next. Looming over the image is Mount Sharp, the mound Curiosity has been climbing since September 2014. In the centre of the image is the rover’s next big, scientific target: an area scientists have studied from orbit and have determined contains clay minerals. Clay minerals requires water to form. Curiosity has already revealed that the lower layers of Mount Sharp formed within lakes that once spanned Gale Crater’s floor. The area the rover is about to survey could offer additional insight into the presence of water in the region, how long it may have persisted, and whether the ancient environment may have been suitable for life. 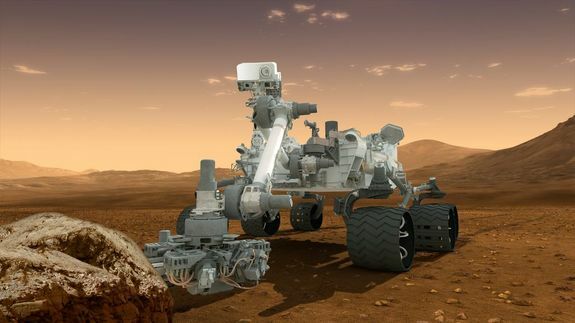 Key to examining the area will be the rover’s drill mechanism, which the science team hope will be able to draw samples pulled from the clay-bearing rocks so their composition can be determined. As I recently reported, a new process for obtaining samples via the drill and getting them to the rover’s on-board science suite was recently tested to overcome a long-term issue with the drill feed mechanism, and the approach is being refined on Earth in preparation for the excursion into the clay region. In the meantime, a new study seeking to explain how Mars’ putative oceans came and went over the last 4 billion years implies that the oceans formed several hundred million years earlier than previously thought, and were not as deep as had been assumed. In particular, it links the existence of oceans early in Mars history to the rise of the massive Tharsis volcanoes on Mars and highlights the key role they may have played in the ancient oceans of the Red Planet. A common objection to Mars ever having oceans of liquid water is that estimates of the size of the oceans doesn’t marry-up with estimates of how much water is retained within the planet’s polar caps, how much could be hidden today as permafrost underground, and how much could have escaped into space. 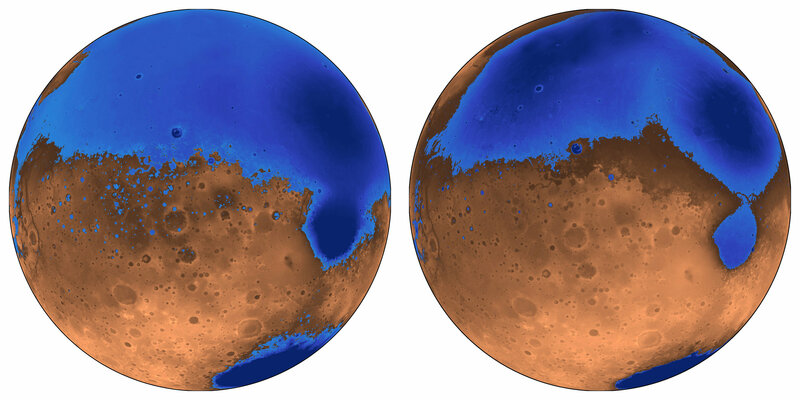 In the new study, from the University of California, Berkeley, it is proposed that Mars’ oceans first formed before, or at the same time as, the massive volcanoes of the Tharsis bulge, 3.7 billion years ago, rather than after them. This would mean that the plains that cover most of the northern hemisphere, which are the presumed to be an ancient seabed, would have extended into the area later deformed as the Tharsis Ridge expanded, and lava flows cut into the plains. Thus, the initial oceans on the planet would have been more widespread – but shallower – than originally thought, providing a smaller overall volume of water. The model also counters another argument against oceans: that the proposed shorelines are very irregular, varying in height by as much as a kilometre, when they should be level, like shorelines on Earth. However, this irregularity could be explained if the first ocean, called Arabia, started forming about 4 billion years ago and existed, if intermittently, during as much as the first 20% of Tharsis’s growth. The growing volcanoes would have depressed the land and deformed the shoreline over time, leading to the irregular heights seen today. This would also apply to the subsequent ocean, called Deuteronilus, if it formed during the last 17% of Tharsis’s growth, about 3.6 billion years ago. Tharsis, now a 5,000-km-wide eruptive complex, contains some of the biggest volcanoes in the solar system and dominates the topography of Mars. Its bulk creates a bulge on the opposite side of the planet (the Elysium volcanic complex), and the canyon system of Valles Marineris in between. This explains why estimates of the volume of water the northern plains could hold based on today’s topography are twice what the new study estimates based on the topography 4 billion years ago. This new theory has two further points in its favour. Firstly, it can account for the valley networks (cut by flowing water) that appeared around the same time.Secondly, both Arabia and Deuteronilus would have existed at a time when the Tharsis volcanoes and those of Elysium would have been active, throwing greenhouse gases into the Martian atmosphere, warming it and increasing its density. Too Much Water To Be Habitable? The latest study to be published concerning TRAPPIST-1, the 7-exoplanet star system 39 light-years from our Sun, suggests the exoplanets may be too wet to have ever supported life – which might sound a little surprising. It also suggests the planets have migrated closer to their planet red dwarf star since their formation. The study was led by Cayman T. Unterborn, a geologist with the School of Earth and Space Exploration (SESE), and used data from prior surveys that attempted to place constraints on the mass and diameter of the TRAPPIST-1 planets in order to calculate their densities, one of which I mentioned in January 2018. Using this data as a starting point, the team constructed mass-radius-composition models to determine the volatile contents of each of the TRAPPIST-1 planets. They found the 7 planets are light for rocky bodies, suggesting a high content of volatile elements. On similar low-density worlds, this volatile component is usually thought to be atmospheric gases. However the TRAPPIST-1 planets are too small in mass to hold onto enough gas to make up the density deficit. Because of this, Unterborn and his teams determined that the low-density component of the seven planets was most likely water. To determine just how much water, the team used ExoPlex, software for calculating interior structure and mineralogy and mass-radius relationships for exoplanets. This allowed the researchers to combine all of the available information about the TRAPPIST-1 system. We typically think having liquid water on a planet as a way to start life, since life, as we know it on Earth, is composed mostly of water and requires it to live. However, a planet that is a water world, or one that doesn’t have any surface above the water, does not have the important geochemical or elemental cycles that are absolutely necessary for life. In addition, the study also suggests that all seven planets in the system most likely formed father away from their star and migrated inward over time – something which has been noted with other exoplanet systems. In the case of TRAPPIST-1, the planets are distributed either close to, or within, the star’s “ice line”. This is a boundary where, within which, ice on planets tends to melt and either form oceans (if sufficient atmosphere is present) or vaporise. Beyond this line, water will take the form of ice and can be accreted to form planets. An artist’s impression of the sky from the outermost of the three TRAPPIST exoplanets in the star’s habitable zone. Given the relative positions of the outer planets to their star’s ice line, the research team determined all seven of TRAPPIST-1’s planets must have formed beyond the ice line, but over the aeons migrated inwards, with the inner planets losing much of their water content through their surface ice vaporising – but leaving a high volume of water still being retained within their rocky crusts. Working out how far – and when – the planets might have formed is made more complicated by the fact that M-type red dwarf stars like TRAPPIST-1 burn brighter and hotter early in their lives before cooling and dimming – so its “ice line” would have contracted inwards as well. Based on how long it takes for rocky planets to form, the team estimated that the planets must have originally been twice as far from their star as they are now. Overall, the study leans weight to the view that TRAPPIST-1 worlds are unlikely to be habitable. Early on, as Natalie Hinkel noted above, they may well have been ice or water covered, but lacking the geochemical and elemental cycles essential for life. Any period in which surface conditions might have been more favourable for life on the inner planets as their ice melted would likely have been comparatively short as a result of the star’s solar activity stripping most of their atmospheres away. To date, around 3,743 exoplanets have been discovered in our galaxy – 2,649 of them by the Kepler Space Observatory, but we’re now approaching the end of life for this veritable planet hunter. Launched in 2009, Kepler occupies an Earth-trailing heliocentric orbit, from which it has sought out exoplanets using the transit method – monitoring a star over a period of time for periodic dips in brightness caused by a planet transiting (passing in front of) the star. In 2012 and 2013, the observatory suffered failures and issues with two of the observatory’s four reaction wheels used to hold it steady while observing distant stars. As a result, a new mission profile, K2 Second Light, was developed in order to compensate for the issues. Unfortunately this required the observatory to use small amounts of its propellant reserves to help hold it steady during operations – and those fuel reserves are almost expended. Mission engineers are uncertain as to precisely when the observatory’s fuel will run out, other than it will likely happen in the next several months. The hope is that there is still enough time to gather as much data a possible from the current observation campaign. The end of Kepler’s mission does not mark the end of the search for Exoplanets from space. 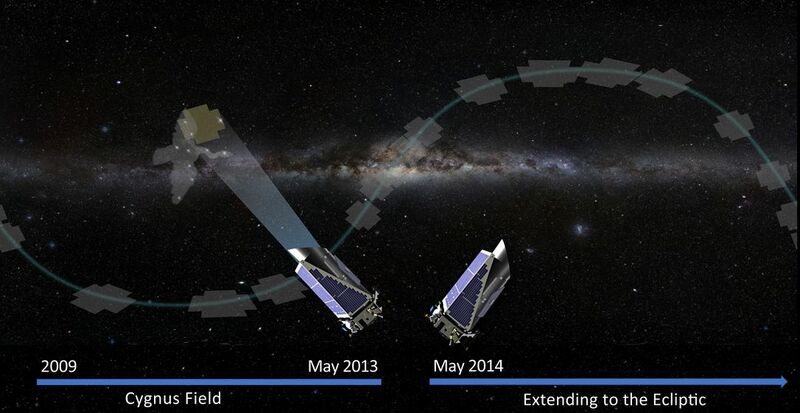 April 2018 will see the launch of the Transiting Exoplanet Survey Satellite (TESS), will conduct transit surveys on a large scale, and in 2019 the James Webb Space Telescope (JWST) will also have part of its mission devoted to the hunt for exoplanets. Both will help build on Kepler’s legacy.